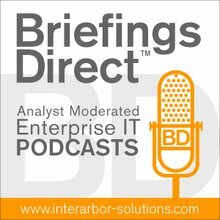 This periodic discussion and dissection of IT infrastructure related news and events, with a panel of industry analysts and guests, comes to you with the help of charter sponsor, Active Endpoints, maker of the ActiveVOS business process management system. Linthicum: We've had a tendency to focus on reducing cost over the last few years, with the reces sion and all, and ultimately cloud computing and SOA are about bringing strategic value back into the business in the form of IT. I was listening to your podcast with Salesforce.com's Peter Coffee, talking about service oriented architecture (SOA) and cloud computing, and he said something that was very profound. The fact of the matter is that, if you're looking for cheap IT, we can give you cheap IT. However, you're not going to be able to keep up with the competitive value that IT needs to bring to your enterprise. To get that competitive value, you're going to have to spend additional money. The ability to align your IT resources to the needs of the business quickly, get into markets fast, delight customers, sell more, and create supply chain integration systems that provide with frictionless commerce is really where the value is in this. The myth is that cloud computing is always going to be less expensive. I think cloud computing typically is going to be a better, more strategic, more agile architecture, but it's also typically going to be more expensive, at least on the outcome. We're probably going to have to spend more money initially. That's really what the takeaway is from the initial cloud-computing projects that I am involved in. At the end of the day, it's about strategic use of technology. Ultimately, cost reduction should be part of the result, but in getting there, we're going to have to spend additional dollars. Rogers: A lot of the enterprises are going to learn from those organizations that have to act at web s cale and understand which are the right use-cases to put out there and how to leverage it. ... A lot of the innovation that we see happening on the cloud is really other providers that are starting to build their businesses on the cloud. They're learning that there is a web-scale business to be obtained out there, and that's really where we are seeing the biggest innovation. They're learning that there is a web-scale business to be obtained out there. What is also really interesting is that it's more than just technology. It's really transitioning to engage with services and services providers. Those who are attempting to move out there onto the cloud are learning that that is a big piece of the puzzle. Many technology providers have to grow into the role of a service provider. Krigsman: I ask the question ... Is cheap IT really the goal [of cloud computing]? To me, the real question, the longer-term strategic question, is "How does this new IT infrastructure map onto our business processes and our business requirements looking long-term?" There are some mismatches and mismatched expectations. When you have one group that is expecting certain types of outcomes and results and you have another group that is capable of delivering results that don’t match the first, namely between buyers and sellers [of cloud services], then the end result is predictable failure or disappointment somewhere down the line. Linthicum: Cloud computing does require lots of changes. You're going to have to redo your infrastructure, as I write in my book, to leverage newer architectural patterns, such as SOA, and that's typically very expensive to get out and access the services that are available to you on demand, out of the cloud. So that's an expense onto itself. You're going to have to retrain and re-skill your people within your data center, all the way up into your executive ranks, on what cloud is able to do and how to manage, govern, and secure cloud. You're going to have to pay for the cloud computing providers, which in many instances are going to be less expensive than on-premise systems, but in many other instances are going to be much more costly than on-premise systems. Companies that think tactically, in quarter to quarter expenses, and consider IT kind of an expense that they rather not have to spend money on are going to fall by the wayside within cloud computing. They're just not going to get it. It's very much like the Internet was in the mid-'90s. Suddenly, it's a big huge deal, and companies that got on board four or five years ago are leading the market, where companies that suddenly were trying to play catch-up football in 1999, 2000, found that the market left them behind. Many of those companies just went out of business, because they didn’t see the wave coming. Cloud computing is going to be very much like that. I'm bullish on cloud computing being a catalyst for architectural change and typically for the better. So cloud is not great at security and governance as of yet, but in many instances it's much better than the current security and governance in lots of these existing enterprises, which is poorly defined or nonexistent. Ultimately, as people revamp their architectures to leverage cloud, moving into SOA, looking at cloud as an architectural option for bit pieces of parts of their data and parts of their processes, they go through an improvement model. They go through some architectural changes, create new governance models, and create new security models. They leverage identity management versus simple encryption. They learn to be more secure. If they didn't have a chief security officer, they may now have a one, if they are moving into cloud. The target systems that are using cloud computing, the target architectures that are leveraging cloud computing, are almost always more secure than the traditional systems from which they came. That doesn't mean they're completely secure and without issues, especially in the cloud computing side. But people make logical choices about what pieces of information and what processes to run in the cloud and which ones to run on-premise based on security models, and typically, if they are revamping into a new architecture, they are always going to be more secure and better governed, if the architects know what they're doing. The pay-as-you-go model of cloud computing, even though it can be more expensive in many instances, when you really kind of amortize the cost over many years, is something that's attractive to at least United States IT. It's not always to foreign corporations, but definitely in the United States. We like the pay-as-you-go cable bill kind of thing that we get, and also the ability to turn the stuff off or move away from it, if we need to, without having a big footprint already in the data center and things we need to deinstall and millions of dollars of hardware that we have to sell on Craigslist if the thing doesn’t work out. That becomes a selling point and really is part and parcel of value of cloud computing. But, it also can be the Achilles' heel of cloud computing, because ultimately people are going to make decisions around financial metrics that may not be realistic. If you look at those financial metrics in light of the requirements of the business, in many instances people are buying cloud computing because of the cost model and not necessarily the strategic value it's going to have to the architecture and therefore have to the business. Krigsman: Driving toward cloud changes the architecture and requires proper governance. The lack of governance that exists today across the industry is pretty startling. So as organizations move in this direction, there is simply no question that the cultural dimension of getting IT to work more effectively with the business side and so forth must drive with it. If it doesn't, then, in the end, the solutions that are built with cloud will still have the same set of problems from a business standpoint that current IT solutions have today. This has nothing to do with technology. This is a matter of collaboration and communication across these various information silos. Rogers: One thing that we're finding from those cloud service providers that had originally targeted the end business customer, is that they're working with the CIOs and the IT departments more. They're working through those issues of security and having backup contingency plans. It's just a state of education that varying parties within the IT ecosystem have to come on board and understand how to leverage this. One of the biggest points ... is it's still a mixture of different technologies that have to come together. That’s always been one of the biggest, complex roles that IT needs to serve. Right now, there are a lot of dependencies on specific technologies internally. A lot of organizations do not want to make those same mistakes with external cloud providers. They're really looking to the IT group as an adviser to guide them and help them in the decisions moving forward. Krigsman: This is a fundamental point -- the cloud computing winners are going to be those who combine architectural vision and discipline with superior governance and who are also capable of making the adaptive cultural and business transformation changes, such as you were just talking about, things like budgeting, for example. Success in the cloud will require a mixture of all of these things together. Linthicum: If you are in the IT world today, you need to understand that if you are moving to a new architecture, you have to commit to a certain amount of value that comes back to the business. Typically, it's going to be a five-year horizon in the United States, perhaps a 10-year horizon in the Asia-Pacific. But, that value has to be shown and that has to be returned. If it's not returned, then ultimately it's going to be considered a failure. You need to start committing to this stuff right now and putting some skin in the game, and I think a lot of people in these IT organizations are very politically savvy and want to protect their positions. There are a few of them who want to put that skin in the game right now. I think we are going to see kind of an unfairness in business. People who are starting businesses these days and building it around cloud infrastructures are learning to accept the fact that a lot of their IT is going to reside out on the Internet and the cost effective nature of that. They're going to have a huge strategic advantage over legacy businesses, people who've been around for years and years and years. There are going to be a lot of traditional companies out there that are going to be looking at these vendors and learning from them. As they grow and they start to go public and they start to grow as a business, they get up to a half a billion mark, they are going to find that they are able to provide a much more higher cost and price advantage over their competitors and just eat their lunch ultimately. We're going to see that, not necessarily now, because those guys are typically smaller and just up and coming, but in five years, as they start to grow up, their infrastructure is just going to be much more cost effective and they are just going to run circles around the competition. ... Ultimately, it would be about the ability to leverage technology that's pervasive around the world. What you're going to find is the biggest uptake of any kind of new technological shift is going to be in the United States or the North American marketplaces. We're seeing that in the U.S. right now. We could find that the cloud computing advantage it has brought to the corporate U.S. infrastructure is going to be significant in the next four years, based on the European enterprises out there and some of the Asia-Pacific enterprises out there that will play catch-up toward the end.